Even beginners will find it easy to create 3-D figures with Dimensions needle felting kits. You'll love making our adorable Bear Felted Character using simple needle felting techniques. Molds and stencils are provided to help create a proper shape for this three-dimensional figure. Finished size: 4.25" x 4". This needle felting kit includes everything you need: • 100% wool roving • Felting needle.. Even beginners will find it easy to create 3-D figures with Dimensions needle felting kits. Create this three dimensional Bird Felted Character using freeform needle felting techniques and simple embroidered details. You might be surprised at just how easy it is! Finished size: 3" x 2.5". This needle felting kit includes everything you need: • 100% wool roving • Felting needle • Felting mat • Emb.. Even beginners will find it easy to create 3-D figures with Dimensions needle felting kits. Have fun creating our sweet little Bunny Felted Character using easy needle felting techniques. Molds and stencils are provided to help form a proper shape. Embroidery thread is included to create the nose and whiskers. Finished size 3" x 4". This needle felting kit includes everything you need: • 100% woo..
Dimensions lets you create 3-D characters with our fun needle felting kits—easy enough for a beginner! Make this fuzzy feline using fun and simple needle felting techniques. Our three-dimensional Cat Felted Character uses molds and stencils to help form a proper shape and embroidery thread to create the whiskers. Finished size 3.5" x 4". This needle felting kit includes everything you need: • 100..
Dimensions lets you create 3-D art objects with our fun needle felting kits-easy enough for a beginner! Create this "scrumptious" Cupcake using easy freeform needle felting techniques and simple embroidered details. No molds needed! Finished size: 2.5" x 3.5". Needle felting kit includes 100% wool roving Felting needle Felting mat Cotton thread ..
Dimensions lets you create 3-D characters with our fun needle felting kits—easy enough for a beginner! Canine lovers will delight in making our Dog Felted Character with simple needle felting techniques. Molds and stencils are provided to help create a proper shape for this happy pup. Finished size 6" x 5". This needle felting kit includes everything you need: • 100% wool roving • Felting needle ..
Dimensions lets you create 3-D creatures with our fun needle felting kits-easy enough for a beginner! You can make this sweet yet sly Fox using easy freeform needle felting techniques and simple embroidered details. No molds needed! Finished size: 3.5" x 2.5". Needle felting kit includes: 100% wool roving Felting needle Felting mat Cotton thread ..
Dimensions lets you create 3-D creatures with our fun needle felting kits—easy enough for a beginner! 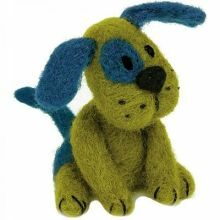 Whether you call him Duke, Rover, or Beauregard, you can make this whimsical Green Puppy using easy freeform needle felting techniques and simple embroidered details. No molds needed! Finished size: 3" x 2.5". Needle felting kit includes: • 100% wool roving • Felting needle • Felting mat • ..
Dimensions lets you create 3-D characters with our fun needle felting kits—easy enough for a beginner! Bring this pudgy little Hedgehog Felted Character to life using freeform needle felting techniques. Our detailed instructions with photographs and patterns make it easy! Embroidery thread is used to add details such as the quills. Finished size: 3.5" x 2". This needle felting kit includes everyt..
Dimensions lets you create 3-D art objects with our fun needle felting kits—easy enough for a beginner! Create this "yummy" dimensional Ice Cream Cone using easy freeform needle felting techniques and simple embroidered details. No molds needed! Finished size: 2.5" x 3.5". Needle felting kit includes: • 100% wool roving • Felting needle • Felting mat • Cotton thread • Embroidery needle • Easy p..
Dimensions lets you create 3-D characters with our fun needle felting kits—easy enough for a beginner! Create our Monkey Felted Character with easy needle felting techniques, using molds and stencils to help create a proper shape and embroidery thread for some of the facial details. Finished size 4 x 4. This needle felting kit includes everything you need: • 100% wool roving • Felting needle • Re.. Even beginners will find it easy to create 3-D figures with Dimensions needle felting kits. You'll enjoy making our Owl Felted Character using simple needle felting techniques. Molds and stencils are provided to help form a proper shape. Finished size 3.5" x 3.75". This needle felting kit includes everything you need: • 100% wool roving • Felting needle • Re-usable felting molds and stencils • Fe.. Even beginners will find it easy to create 3-D figures with Dimensions needle felting kits. Create this three-dimensional Penguin Felted Character using simple freeform needle felting techniques. Finished size: 2.5" x 2.5". This needle felting kit includes everything you need: • 100% wool roving • Felting needle • Felting mat • Easy step-by-step instructions NOTE: As this is a freeform project, ..